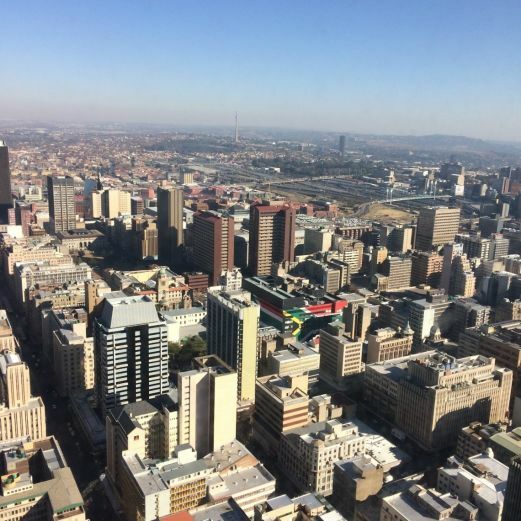 Ask any old Johannesburg hand: the City of Gold is bliss in summer. Not only does the sprawling metropolis boast possibly the best climate in the world, traffic woes, too, are a thing of the past for a week or six once schools close for the holidays in early December. What’s not to love? You can spend the best part of a day at The Zone @ Rosebank and its neighbours, the shiny Rosebank Mall and upmarket The Firs retail centre, shopping, eating, hanging out in coffee shops or catching a movie. Once you’re tired of checking out the stores, find a seat at a leafy outdoor cafe and watch the passing parade of trendy urbanites. On Sundays, don’t miss the Rosebank Sunday Market on the mall’s upper-level parking lot with its wide range of fashion, food and other stalls. The Zone @ Rosebank is at 177 Oxford Road, Rosebank, and is stop 1 on City Sightseeing’s Johannesburg Green Tour. Visit the ticket office in the Tyrwhitt Avenue pedestrian zone next to Hamleys, or buy your ticket on the bus (you can also hop on or off at any of the other stops on the route). Generations of locals have spent languid summer days paddling on Zoo Lake or picnicking beside it – and so can you. This large landmark in verdant Parkview is home to a large colony of ducks and other waterfowl that roost on the island in the centre of the lake – see them up close from your rented rowing boat (bring a hat and sunscreen). Have your picnic while afloat, or on the lawn; otherwise, head to popular Moyo overlooking the lake to hang out on the deck and sample the restaurant’s range of pan-African dishes. Zoo Lake, on the corner of Lower Park Drive and Roscommon Road, is stop 2 on City Sightseeing’s Johannesburg Green Tour. Opening hours are 6am to 6pm; entry is free. Sprawling Joburg Zoo has plenty of space to roam for the Big Five, an impressive pack of African wild dogs, an alarming number of large crocodiles and about 300 other species of animals and birds. This is a great Jozi family destination and an institution that has been around for more than a century. Bring a picnic, or take advantage of the kiosks and restaurant. Joburg Zoo is on Jan Smuts Avenue, Parkview, at stop 3 on City Sightseeing’s Green Tour. Opening hours are 8.30am to 5.30pm (last entry 4pm) and tickets costs R80 for adults and R50 for children, pensioners and students. There’s a reason Joburg is called the City of Gold. So, for a different sort of adventure, head to Main Street in downtown Johannesburg, near the site where the precious metal was first discovered. Saunter around the pedestrianised mining district to see everything from an old platinum mineshaft headframe (the structure seen above an underground mineshaft) to the well-known Impala Stampede sculpture outside the Anglo American headquarters. Also head down Simmonds Street to visit the Mineshaft Museum at the Standard Bank head office. Main Street is between Sauer Street and Simmonds Street, Johannesburg, and stop 10 on City Sightseeing’s Johannesburg City Tour. Joburg is known for its trees – millions of them. See the verdant vistas, and plenty more, from the top of the highest building in Africa, the 50-storey, 223m Carlton Centre. On arrival, a City Sightseeing guide will meet you at the bus stop and take you to the viewing area, from where you can marvel at mind-blowing views of Braamfontein, Hillbrow and the urban forest of the northern suburbs to the north; the remains of the mining belt to the south; Soweto’s FNB Stadium (also known Soccer City during the 2010 FIFA World Cup); and, on a clear day, even further afield. The Carlton Centre is at 150 Commissioner Street. Hop off at stop 11 on the Johannesburg City Tour. If it’s a Saturday in the city, this one’s a no-brainer if you’re looking for a good vibe and some of the best food this side of the equator. 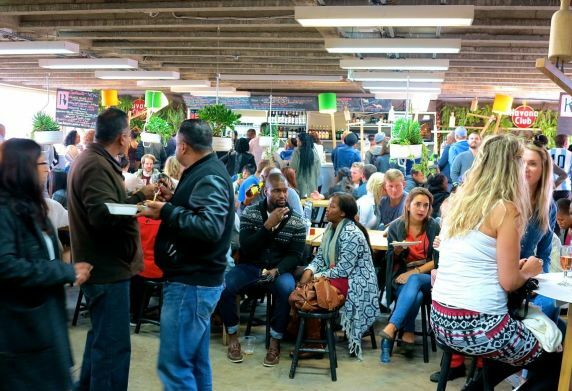 The trendy Neighbourgoods Market in Braamfontein has everything from curries and dim sum to gigantic pans of paella and enough sweet treats to keep you going. Don’t forget the craft beer and coffee. This is the place to mingle with a cross-section of Jozi’s coolest. The market is on the corner of Juta and De Beer streets. Hop off the City Sightseeing bus at stop 17 in Melle Street on the Johannesburg City Tour. 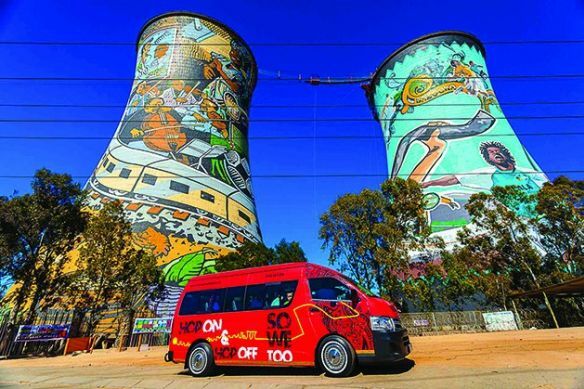 Soweto beckons, and the easiest way to get there is by hopping on City Sightseeing’s Soweto tour, an extension of the Joburg City Tour. Hop off at the famous Vilakazi Street, where both Nelson Mandela and Archbishop Emeritus Desmond Tutu used to live. Wander around reflecting, visit the Mandela House museum, browse the market stands and grab a bite to eat at one of the area’s restaurants. The Soweto tour departs from City Sightseeing stop 13 at the Gold Reef City Casino Hotel once an hour. Meet your tour guide and driver at the hotel. 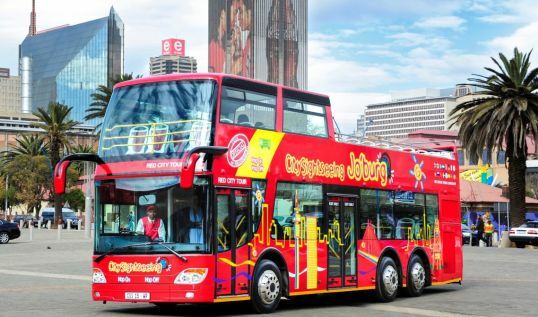 View the City Sightseeing Johannesburg timetable here. Buy your tickets at the ticket office in Rosebank, or on the bus. If you’re based in Sandton or Melrose Arch, there are shuttles from selected hotels to and from The Zone @ Rosebank. Be sure to buy all your tours and tickets online and save! For more information and updates, keep an eye on the City Sightseeing website, and follow us on Facebook and Twitter.